The book mainly focuses on Pandas which the book’s author, Wes McKinney, is the main developer of. Further, it covers iPython, numpy and matplotlib. Numpy is actually also covered in a more “advanced” chapter as well. Furthermore, one of the chapters went through examples of how to scrape data from the Internet (very useful indeed). Since I had some knowledge on the programming language R’s dataframe concept I found using Pandas very easy. You can easily carry out descriptive analysis by using different functions built into Pandas. Python for Data Analysis is not for the programmers, or researcher who already have good programming skills, but rather for researchers, statisticians, students and the like who already have a basic knowledge of programming. That is, although I found the book useful in the sense that I did not know of pandas and matplotlib before I read it did not help me to meet my goal – to improve my Python skills. 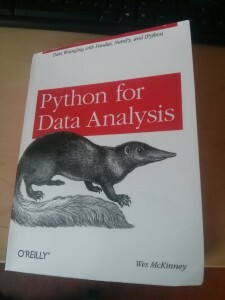 Who is the Python for Data Analysis for? With that said, the book is not an introduction to Python, some prior knowledge may be required. In spite of this, I will probably use both Pandas and matplotlib. Eventually, I guess the book will have helped my progression of Python skills. In fact, Matplotlib is a very intuitive library for plotting in Python. See this YouTube video on how to install Pandas. In conclusion, the book was not that expensive. Furthermore, it will give you the right tools to carry out big data scraping and analysis. I also found out about matplotlib which is a very intuitive library for plotting. If you are looking for a book on useful libraries in doing data analysis (may it be ‘small’ or ‘big) this book is really useful. You will also get practical examples that might be applicable to your interest. My overall impression is that this book is worth buying. If you are living in Sweden you can buy the book on www.cdon.se or www.adlibris. com (or find the most reasonable price at www.bokfynd.nu).